The Diamond Cross Ranch has been featured in countless national ad campaigns for its rich beauty and Western heritage. Our family has been in Jackson Hole for 100+ years. 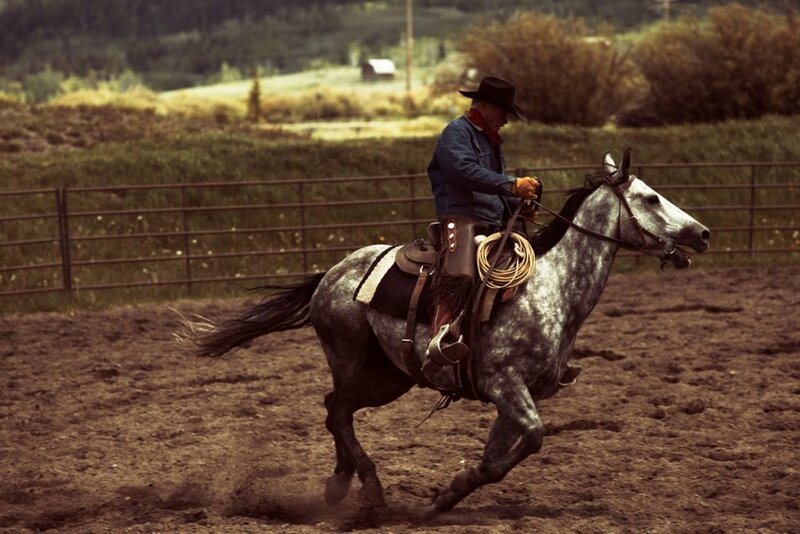 Our grandfather, Walt, who purchased the ranch, is in the Wyoming Cowboy Hall of Fame. The ranch features unobstructed views of the Grand Tetons. The Buffalo River cuts through the green fields, offering fishing, rafting, and nearby hiking trails. Horses and cattle graze in the lush green fields, and Bridger-Teton National Forest and Grand Teton National Park surround the ranch. Diamond Cross is located 5 minutes from the entrance to the Grand Teton National Park, and about 20 minutes from the Jackson Hole airport. We are experienced in working with large production teams (Marlboro Men, Stetson, State of Wyoming, Ralph Lauren, Filson, Kanye West, etc). There are several food and lodging options within a ~3 minute drive. We do not offer lodging on the ranch, ensuring that your team has complete privacy. For those looking to book hotel rooms, there are several outstanding options within a short drive, and we are happy to work with you to secure accommodations. The barn has high ceilings, can house heavy equipment and provides office space for field teams and editors. The big red barn also offers large areas designed for computer and editing equipment. A large parking area has space for 20+ trailer-trucks, buses and other rigs. The wide roads leading into and out of the ranch allow for easy vehicle access. We offer authentic ranch tack, trucks & tractors, barns, outdoor hiking and horse trails, horses, cattle, and gear to assist with set design and authenticity. The Greater Yellowstone area is one of the most diverse ecosystems in North America. If certain animals are desired for shots (example: buffalo) we can work with your team to source them. All of our domesticated ranch animals (horses, cattle, dogs) are comfortable around large productions.